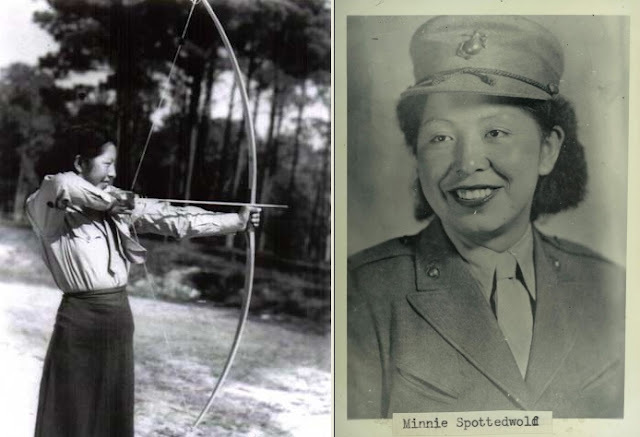 Minnie Spotted Wolf, Blackfoot, was the first Native woman to enter the Marine Corps Women's Reserve in WW ll. Responses to "Honoring Minnie Spotted Wolf, the first Native American woman in the U.S. Marine Corps"
BULLY FOR MINNIE FOR FIGHTING THE SYSTEM FOR WHAT SHE WANTED TO AC- COMPLISH. AND BACK IN 1941, THAT WASN'T EASY FOR NATIVE AMERICANS, ESPECIALLY NATIVE AMERICAN WOMEN. i PAY TRIBUTE TO HER COURAGE AND RESOLVE, HER SUBSEQUENT CAREER AS A TEACHER, AND TO HER HERITAGE. LONG LIVE MINNIE'S LEGACY!!!! Great story of a strong native Indian. Hooray for Minnie! And Boooos for the Army recruiter who couldn't see what a choice recruit he lost! "...She first expressed an interest in joining the army when she was aged 18, shortly after the US entered into World War 2 at the end of 1941. However she was initially discouraged by a recruitment officer who told her that the war was 'not for women'. On completion of her training Spotted Wolf went on to serve 4 years in the Marines in California and Hawaii. She drove trucks loaded with heavy equipment, a job normally reserved for men, and also sometimes worked as a jeep driver for visiting generals. Spotted Wolf's career quickly gathered media attention and she was featured in numerous news stories, and even her own comic book, to promote the war effort. ..."